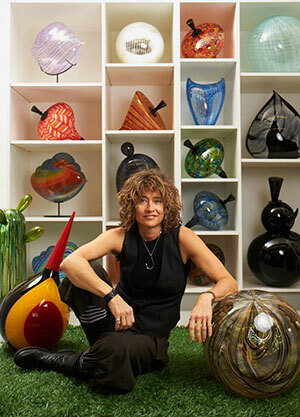 Nancy Callan’s artistic voice as a glass sculptor reflects her high-level training and talents. Callan attended the Massachusetts College of Art (BFA 1996) and lives in Seattle, WA where she is part of the vibrant Northwest glass community. Callan’s numerous awards include the Creative Glass Center of America Fellowship and residencies at the Museum of Glass (Tacoma, WA), The Toledo Museum of Art (Toledo, OH), and the Pittsburgh Glass Center (Pittsburgh, PA),and The Chrysler Museum (Norfolk, VA). She has been a key member of maestro Lino Tagliapietra’s glassblowing team since 1996. Callan has been exhibiting her work since 2001, her galleries include Traver Gallery in Seattle, WA, Schantz Gallery in Stockbridge, MA, Hawk Gallery in Columbus, OH, Blue Rain Gallery in Santa Fe, NM, and Holsten Gallery. In addition to exhibiting and creating her own work, Callan enjoys the challenges of teaching and sharing her skills with students. She has offered advanced glassblowing workshops at the Pilchuck Glass School in Stanwood, WA, The Pittsburgh Glass Center, Pittsburgh, PA, Haystack Mountain School in Deer Isle, ME and Penland School of Crafts in Ashville, NC. Callan also enjoys collaboration and frequently works with NYC lighting designer Lindsey Adelman on custom projects.